Again with the Handmade Monday! And again with the food! This week is SO Handmade too. This is what I was going to make LAST Monday but I couldn’t find the magic ingredient and had to order it. Rennet. If you don’t know what that is, then you’ve probably never made cheese or never known anyone who has. I actually thought the starter would be harder to get, but I was able to find kefir starter at Whole Foods (after looking 2 other places). But rennet was NOT to be found anywhere. You used to be able to buy rennet tablets (made by Junket) in the pudding section of the local grocery store, but those don’t seem readily available anymore and besides a little reading online told me that those are a bit different than the liquid rennet that you use for cheese anyway. So, I ordered liquid rennet from New England Cheesemaking Supply Company and should now be ready to make cheese for quite some time. I have to admit, making the actual cream cheese was about 1000 times easier than getting the rennet was! And, it made the stuff you buy in the store taste like an entirely different animal! So, without further adieu lets go check out how to make your very own Cream Cheese! Oh wow ! you’re a great cook, I admire your ideas, your work. Again I dream to live near you and eat the cheese ! Thanks for the comment on my “Apron Art” post! I’m just glad to be able to do something with rugrat despite my lack of artistic abilities. And now I’m here, admiring your cooking abilities and being reminded of another skill I lack. LOL I’m getting hungry just looking at this! 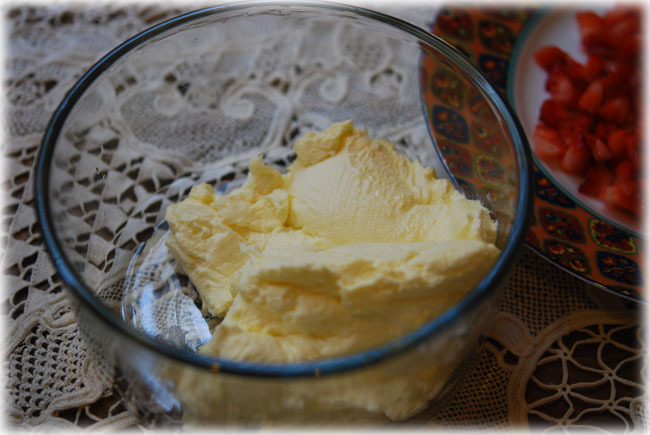 It looks so comforting and yummy… I had no idea you could make your own cream cheese! I was thinking that to make cheese, you’d have to leave milk uh, well, sitting around, long after its expiration date. LOL I know, silly huh? Nice blog BTW!